Yes, I know, you're probably all curious and wondering how the Pro Coro individual auditions went for me. Lucky for you, dear readers, it appears that my sense of shame does not hinder me from sharing my experience with you. Firstly, you know it's not a great sign when you arrive at an audition and the response to your arrival is: "You've allowed no time to look through the quick-study." "Great..." I thought to myself while trying to stifle a flashback to the powerpoint presentation that remained half-finished on my laptop, a string of last-minute supervisor edits in my inbox, and an evening submission deadline looming. "Focus," I said silently to myself, as I cued myself back to the present. As I stood there in the hallway, I glanced down at my watch. "I still have 5"ish" minutes," I thought to myself. I took out my tuning fork, struck it, and held it to my ear, why couldn't I find my note? I paused and noticed the dominant piano accompaniment echoing from the room next door. Oh yes, there's a festival class going on right now. Why do I suddenly hear the music on the page? Oh, somebody who was on-time was working through it on the piano in the practice room. While standing at the music stand in the hallway, I attempted to work through some of the initial intervals in the piece. Suddenly, I noticed the same feeling of cascading frenzy I get when I attempt to cram before an exam. This was not helping. I should just go in. 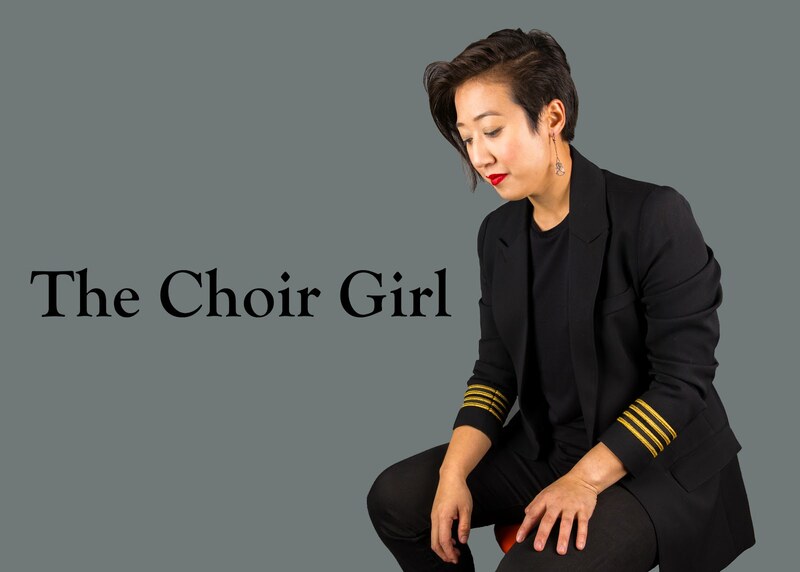 I knew very well that the audition was constructed in a way that would make my choral deficits extremely apparent. Therefore, I should just embrace it. You can tell I'm a Science student, right? Confounding variables aside (a.k.a excuses), I am not surprised by my performance because it was representative of my skill level in that particular construct. If I had to estimate my sight-reading mean, meaning a piece that would give an average view of my abilities, it would be something formulaic by Handel. Thus, if I were to sight-read something like that, I would be able to make my way through it relatively unscathed. My performance dispersion on either side of the mean highlights a ± 1 standard deviation, encapsulating 68% of my sight-reading abilities. 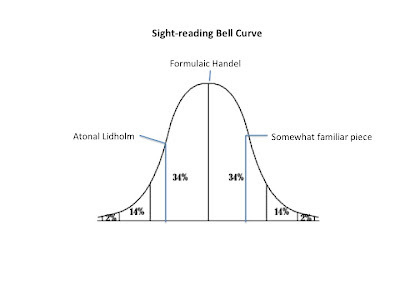 The upper 34% would be like sight-reading pieces I have sung in the distant past, thus, increasing my perceived performance proficiency due to familiarity. 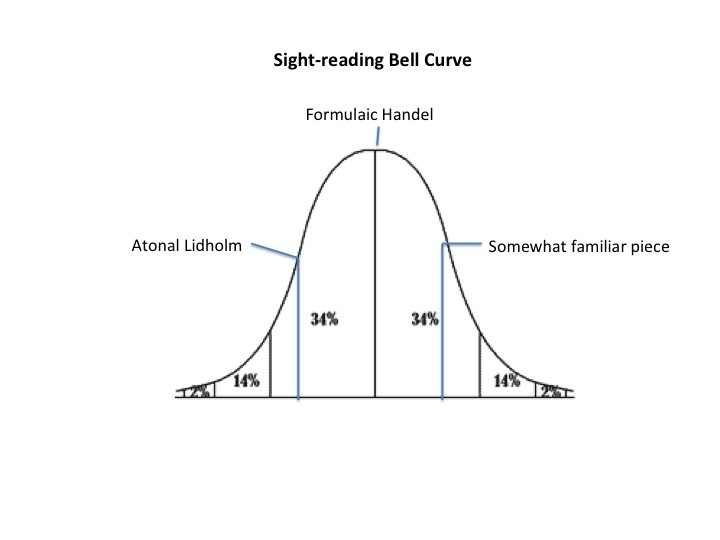 The lower 34% would be pieces with no predictable tonality patterns to use as an aid, such as the atonal Lidholm passage that was the quick-study for the audition. You can probably imagine the outcome. One does not just suddenly acquire the skills overnight to spontaneously sight-read music like Lidholm. My music learning occurs within a tactile-motoric modality paired with auditory feedback (a.k.a learning by ear), the visual input from the music notes play a less dominant role in my music learning process. Definitely not ideal but, unfortunately, that is the compensatory skill I have acquired in order to learn music. While it serves me functionally within a choral setting, it is glaringly obvious that this is the case when faced with an audition framework. Thus, even with insightful coaching within the audition session, follow-up attempts did not elicit a significant improvement. However, it did give me new sight-reading considerations to ponder. As for the other components in the audition, the Anton Webern test piece felt more shaky than I anticipated. I wasn't certain if it was just me, the piano accompaniment or maybe components of both, but it didn't feel settled. There were also some standard range and color exercises. Oh, isn't it always humbling to sing around your upper and lower voice breaks? The art song at the end of the session felt like a self-produced musical send-off. Which was a gift, really, since it was the only thing we had control over within the audition construct. Overall, how did I feel regarding the audition process? I was definitely wavering between pangs of shame and humor (frustration is not a fruitful emotion to bear)... followed by an intermittent sense of worry. Alas, there is no time to dwell on the past since the individual audition is just one part of the audition process. Mini ensemble work begins today. Stay tuned, it's going to be an interesting weekend.